The year is 2016 and Mark Zuckerberg has absconded with all of our data from Facebook. This is the premise for the Data Drive – a dystopian version of the social network that looks like a mashup of Windows 93 and one of your childhood art projects. The Facebook parody was designed and written by Daniel Kolitz and coded by Sam Lavigne as part of the publishing collective Useless Press. It’s hard to determine the aim of this project at a glance. The pair have gone to great lengths to create the site and develop the content in a realistic manner, so surely they want it to achieve more than comedic recognition. My only wish is to bring Mark Zuckerberg to justice. Take that as you will. I’ve always found Facebook’s rhetoric of ‘connectedness’ and ‘transparency’ to be flagrantly hypocritical, given the various undisclosed uses the site makes of our (willingly proffered) data, as well as the oft-commented-on inscrutability of Zuckerberg himself, who might be the sole Facebook user safe from the data-mining he subjects his millions of users to. He (or his algorithms) know quite a bit about us; we know nothing about him. So in a way, Kolitz was trying to subject Zuckerberg to the same type of exposure that Facebook users experience every day, whether knowingly or otherwise. 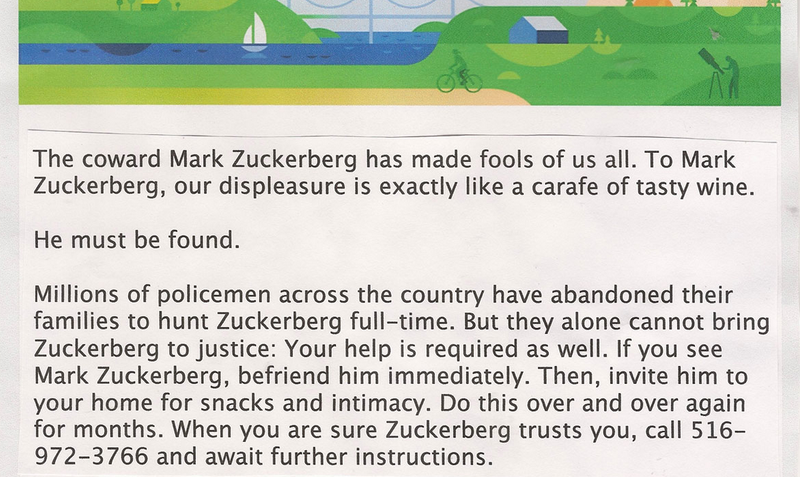 Using scissors and paper and jokes, I wanted to register some small protest against the all-mighty Zuckerberg, via re-imagining him as a much sillier and more sinister version of himself. I agree that it’s ironic that Zuckerberg is so private while his website encourages such a high level of openness. Admittedly, he has been more strategically open about his life in recent times, such as when he revealed that he and his wife are expecting their first child after experiencing three miscarriages. While this is a very raw thing to openly discuss, it also serves a purpose when it comes to promoting conversation about the topic. I can’t shake the feeling that Zuckerberg had his philanthropic hat on for this announcement (which isn’t a bad thing), and it isn’t necessarily a case of him being as open as he wants the rest of us to be on Facebook. When baby Zuckerberg arrives, will the pair be sharing her daily adventures publicly like so many parents do on Facebook already? Perhaps, but I suspect not. The Data Drive succeeds in putting the spotlight on Zuckerberg’s privacy and Facebook’s eagerness for our personal information in a way that will make people think twice, after they realize it’s more than just a comedic take. It offers a fresh take on the ‘traditional’ lament about the social network’s privacy issues. While I don’t think the Data Drive alone is enough to kick off any sort of revolt against Facebook, it might be enough to get the ball rolling. I suspect it will rile people up to take more notice of the company’s requests for data and the hypocrisy of its founder’s transparency.